Project Description: Originally known as Cheapskate Hill for its historical use by people seeking free views of the racetrack at its base, South Hill exemplifies the open spaces that make San Luis Obispo a wonderful place to live. 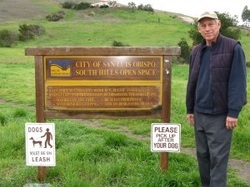 In 1998 Lionel rallied residents of neighborhoods around the open space to plant live oaks, toyons, and valley oaks around a seasonal drainage at the Exposition Drive entrance to one of the spaces trails. Since then, the trees have taken root and are doing their work stabilizing the drainage, providing habitat, and beautifying the land. Read more about the site, as well as view historical photos at here.